After a particularly harrowing night after day care last night I wanted to make sure I picked the guys up nice and early so as to avoid any late night freak outs. My picking them up late combined with them eating late, me accidentally showering them with ice cold water in the fridge, and a difficult bed time made for a challenging evening. Tonight was going to be different. The result? I ended up showing up later than I've ever shown up to pick them up thanks to a tremendous amount of unexplained traffic on I-95. They both fell asleep instantly in the car so I tried a new trick. I didn't give them dinner but, instead, just fed them two large bottles while they slept then slipped them out of their seats and put them in bed in their clothes. This ended up being one of the smoother bedtimes in a while. Maybe that will be my new tactic. No dinner. Just put the babies straight in bed when they get home in their dirty clothes. I am a phenomenal parent. Given that I was expecting to get home a little late (though not quite as late as it ended up being) I picked up a rotisserie chicken and some fixings to make tacos. 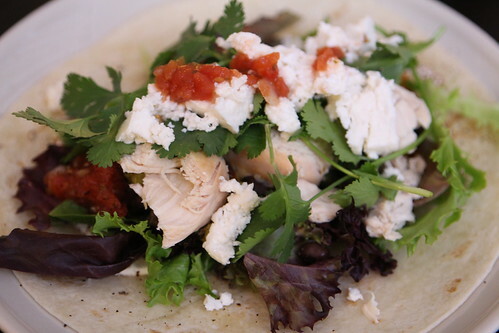 I shredded up the chicken and served it on a tortilla with lettuce, sour cream, guacamole, salsa, cilantro, black beans, queso fresco, hot sauce, chili powder, and cumin. 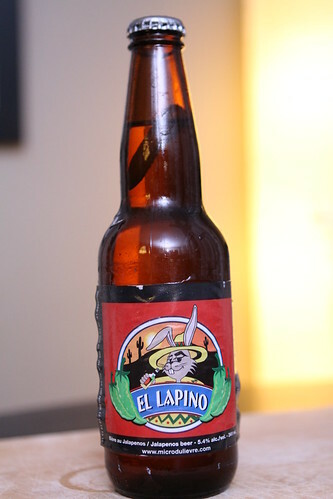 I figured tonight was as good a night as any to drink this El Lapino from Microbrasserie du Lièvre. This is a beer brewed with jalapenos with an actual jalapeno floating in it. I was a little nervous about this one. I wasn't expecting it to be great. It was definitely something a bit different but I was excited to give it a try. 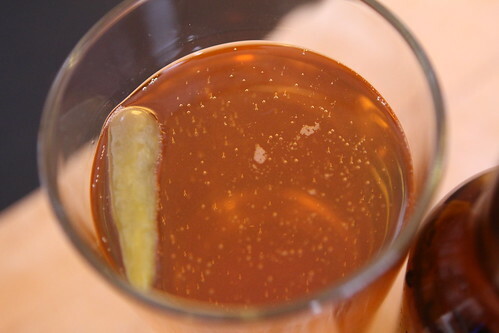 It was the worst thing that I've ever had to drink in my entire life. There are only two beers that I can think of that came close to this bad. There was my experience with the dreadful after-ski beer, La Dragonne, and the absolutely horrid Rogue Voodoo Doughnut Maple Bacon Ale. I had to think about it for a while. Why was this worse than those other two? What made this one worse is that I only had one sip. The other two I tried multiple sips of before ultimately dumping them down the drain. With this one I took one sip then instantly regretted it and I suffered for ten or fifteen minutes afterward. This beer had jalapenos in it so, obviously, I had expected some heat. What I got was a mouthful of capsicum. There was no flavor to the beer at all, it was just raw heat. It would have been better to have taken a drink of hot sauce. At least then there would presumably be some flavors going on. If I had to pick a flavor for this beer I guess I would say it tasted like pain. I can respect this brewery for trying this beer. I am always intrigued by beers like these that push boundaries and try new things. Even when some of those beers aren't fantastic I think it's really good to push limits and break conventions. However, I think at the bare minimum you need to be left with a palatable product. My minimum standard for a beer would be that I'd be able to drink the entire bottle without being in pain or feeling nauseated. Neither would have been possible with this one. In saying this I was saddened to learn that the brewery that made this beer actually burned to the ground earlier this year. While this may have been the worst beer I've ever had in my life I respect them for taking this chance and I'd very much like to try another of their beers to see what this brewery is capable of. If you want to help support them you can check out Microbrasserie du Lièvre on their Facebook Page. After that terrible experience I tried another beer from New Hampshire, a gift from my aunt Pat. 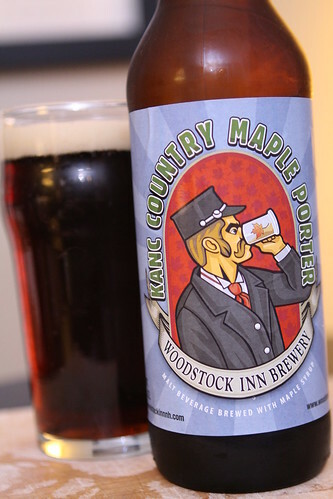 To try to help balance out the burning feeling in my mouth I went for something malty, this Kanc County Maple Porter from Woodstock Inn Brewery. Unfortunately I really couldn't taste much of it at first. As I moved through the bottle I could slowly start picking up on the nice maltiness and balance from the maple. It was a very nice porter. I'd recommend giving it a try. Just don't have a jalapeno beer beforehand. We kept up with our latest trend of watching baseball movies from the 1980s that we somehow missed by watching Bull Durham. While watching we discovered that apparently it was standard practice to have an offensive voodoo person on your team in the 1980s. The same way it was required to have an silly and offensive Asian friend in any comedy. People who talk about the good old days have really short memories. I'm still reeling that you guys had never seen Major League. All the "juuuuuust a bit outside" jokes you've been missing out on! Well, we haven't missed out because EVERYONE knows that joke. I remember when the commercials were on TV that was the main thing they always showed. And we've seen bits and pieces enough to know pretty much 99% of the movie. It's like you don't have to see Casablanca to know half the quotes in the movie. And, yes, I just compared "Major League" to "Casablanca." DEAL WITH IT! Major League is a wonderful movie. What;s this Casa Blanca movie about. Is it a romcom with Jennifer Anniston or maybe Tina Fey?